There are many routine website management tools you need to use in order to maintain your website (e.g. File Manager, FTP program, Email Account Setup, Disk Space Usage, etc.). For this reason, a one-page control panel is an indispensable tool for almost all web hosting plans. cPanel in particular, is the leading control panel interface in the web hosting industry today for its user-friendly interface and customizability. To get a sense of how user-friendly it is to use cPanel, please visit our cPanel Demo page. 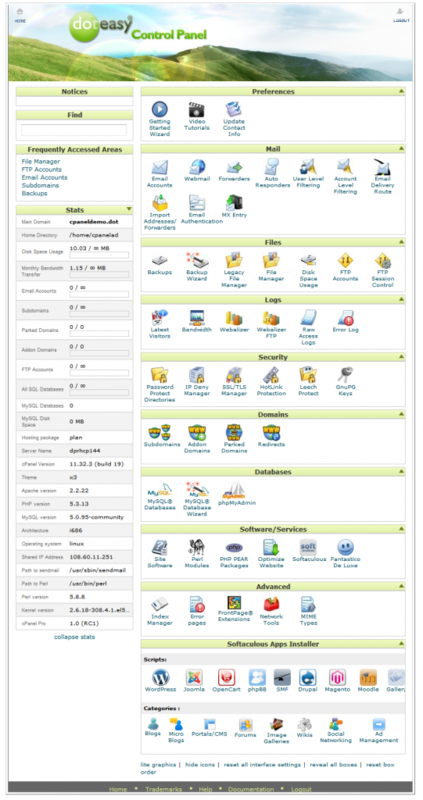 cPanel is an icon-driven interface which enhances better navigation behaviour. It is customizable, meaning you can re-locate or even hide certain fields based on your preferences. Check out this video as we walk you through the navigation steps in cPanel! If you’re on a PHP web hosting plan with us, one of the most attractive features of cPanel is the Softaculous web tool, an automatic script installer which can aid you in the installation of 250 powerful scripts in just a few clicks. For each script, you can find the “See Demo” button and the “Admin Panel” button. As the names suggest, you can view an actual web page installed with the script and also test out the script by logging into the admin page. If you like the script, simply hit the “install” button and the installation proceed automatically, very much like an app installation on your smartphone! Wanna try it out first, check our our Softaculous demo page. We’ve prepared another video to demonstrate how quick and easy it is to install a script with Softaculous. If you are currently using Ensim panel or a subscriber to our Basic Hosting plan and would like to upgrade to the Unlimited Hosting Plan with cPanel and Softaculous, please contact our Tech Support through our Live Chat System, Support Ticket System, or Service Hotline. Check out this page for full details!